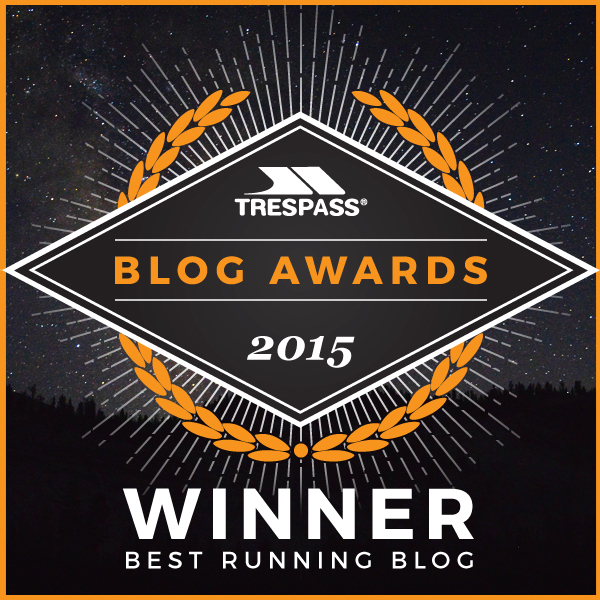 Green Belt Relay – Round 3! Last weekend was the annual Green Belt Relay, it’s one of the Chasers favourite events of the year and never fails to be an awesome weekend away. Bryn smashed the leg 17 course record by over 3 whole minutes! I didn’t crash a minibus! Huge thanks to the Stragglers, and everyone else involved in organising the GBR, and Bryn for organising the Chasers. Until next year! 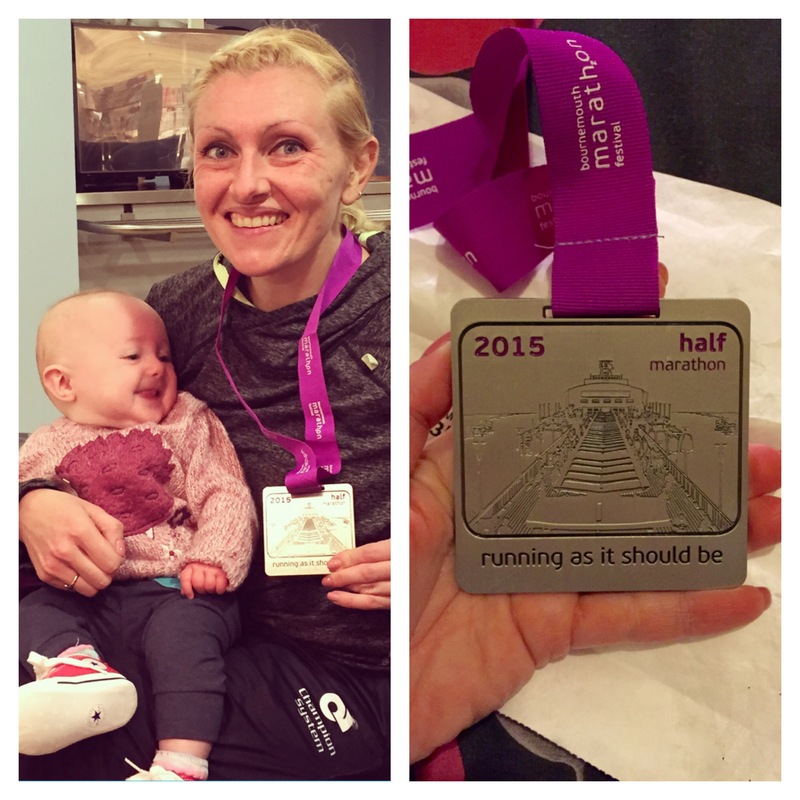 On Sunday I ran the Hampton Court Half Marathon. I always think a half during marathon training gives you a real indication of how it’s going, it lets you know if you’re on track to hit your target, or if you need to re-evaluate your goal. For this reason I was nervous, more nervous than I had been about a race for a while. It was a pretty early start to get over to Esher for an 8:30am race start but I was pleased to bump into some other Chasers. They operated a wave start system but, rather than using coloured zones and policing it, people could start where they wanted so it wasn’t ideal. It also started late, 16 minutes late to be exact, which was quite frustrating when you’re stood in the cold in just a vest. Apparently there were issues with the park & ride system where they wanted people to pay £6 and get on a bus to the start – I ignored this and parked near the start for free, looks like that was a good idea all round. Definitely room for improvement on the organisational front. I made the bold decision to start with the 1:40 pacer, or rather hang just behind the 1:40 pacer and see what happened. The plan was to hang onto him for as long as I could, but I didn’t want to let go until at least 7 miles…ideally. The route was on a lot of pavements along open roads which I think made it difficult for the pacer to keep an even pace, add in weaving around people who had started in the wrong place and I felt like I was all over the place! Every time we sped up I thought I was going to lose him, then we settled down again and it felt comfortable. This went on until around 6.5 miles when he started to disappear as we ran along the river. Annoyingly I had forgotten to turn the mile alerts back on my watch after my last track session so I didn’t really know how much time I was losing, but I felt like I was plodding. Often during the back half of a race I mentally give up, I allow myself to slow down and tell myself I don’t care about the clock, but that didn’t happen, I just kept pushing as much as I could. The last mile seemed to drag but eventually the crowds thickened and I crossed the line in 1:44:01…90 seconds off the pace but slightly better than I thought towards the end. I wasn’t entirely sure how I felt about it, I’m still not. The route itself wasn’t particularly scenic, apart from a small section where we ran past Hampton Court, it was quite dull. It was fast and flat with great PB potential, but it took you on a lot of pavements along open roads which wasn’t ideal, together with the disappointing start I think the only reason I would do it again would be for convenience rather than anything else. That said, you got a great medal and the goody bag was well stocked! On the plus side, I think I made back my race entry fee in Vita Coco, my favourite! It probably won’t surprise you that the thought of a DNS next to my name horrifies me. It doesn’t really matter what the reason is, or how sensible it might be, I don’t cope well with the mental anguish of feeling like I failed before I’ve even started. When I woke up on Saturday I felt dizzy, sick and completely drained, but, worse than the thought of dragging my arse out of bed and into the gale force winds, was the thought of a DNS, I couldn’t be a DNS in the motherland. Saturday was the Dorset CTS, one of the races in the Endurance Life Coastal Trail Series. There are 10 in total around the country, but Dorset is only one of 2 labelled ‘extreme’, meaning it’s utterly brutal on the heart, lungs, legs and, potentially, the soul. Dorset also happens to be my home county, and World Heritage site Lulworth, on the Jurassic Coast, is one of the most stunning locations in the UK. Durdle Door on a sunny day! Home to both Lulworth Cove, a remarkable landform that attracts swarms of tourists, and Durdle Door, a natural limestone arch that juts out in the sea, as well as rolling hills, coastal walks and cosy pubs, it’s a trail lovers dream. As you know, I’m undecided on my love of the trails, but I do love Lulworth, Chaser weekends away and cosy pubs! I headed down with the usual suspects, Frankie, Albro, Russell and Lorraine, and the train journey was full of the usual banter, G&Ts and crisps. Russ thoughtfully broke out the Scorpion Chilli Death Chocolate because, well, what else would you eat before an extreme trail race? I’ll hold my hands up and say the alcohol probably didn’t help, but it usually takes a lot more than that to make me sick, and it certainly doesn’t make me shiver. I sadly took myself home to bed whilst the others stayed in the pub of many ciders. The next morning I truly felt dreadful and had zero energy, I had barely slept all night and could only manage a cup of tea and half a slice of toast. I made a sensible decision to downgrade from the 16 miles to the 10k. It’s one thing to push yourself through a few miles but 16 is actually quite a long way, the winds were crazy and the course was tough, as much as it hurt, 10k was more than enough today. Heading down to the start I realised just how windy it was, apparently the winds were up to 50+ mph when you got up to the exposed areas along the front. I had made the right choice. It was easy to downgrade at registration and, unsurprisingly, I wasn’t the only one and bumped into a fair few other Chasers doing the same! I met Mum and Dad who had come along for spectating duties and we watched the start of the half, the Ultra and Marathon had already started so Cat and Frankie were long gone. I spotted Chris at about 12 miles in his 33 mile race looking, err, windswept, but strong! At the top the view opened up over the sea and Durdle Door and you could see the hills that were to come! The first 3 miles is made up of 4 hills but, although the descents are more than runable (even for me!) it was a real struggle against the winds and you had to throw a lot of force into carrying yourself forwards. On one descent down towards the sea, the wind was so strong it was blowing all the gravel straight into my face, I couldn’t see but, hey, free facial?! The battle against the wind became comically funny as it literally blew you across the course, I was too scared to take any photos in case my phone blew away! At the 3 mile point, the course turned around and headed back on a pretty much continual slow descent. Slightly more inland than the completely exposed front, and with the wind behind us, it became much easier to actually run, in fact, it became pretty much impossible to walk as the wind threw you forward. We ran through a caravan park and onto the final descent down to the finish line, it was quite steep in places which was a hairy experience in the wind! I got a big cheer as I rounded to the finish line and was really pleased to have finished my first run in 3 weeks, albeit with a slightly sore calf and out of control hair! The folks were glad I dragged them out on a blustery day! I was a little sad I hadn’t been able to do the 16 miler, but I really don’t think I would have got through it and there’s always next year right?! We had the usual Chaser success with a win in the half and numerous top 10 finishes as well as Chris facing his previous Dorset CTS demons with an impressive 11th paces in the 33 mile ultra! In the evening nearly 40 of us descended on a wonderful little pub in Wool for celebrations, unfortunately I was still feeling a little under the weather so I missed the after party but I heard it was a success! Dorset CTS is a fantastic event, it really is worth it for the views alone, it’s a beautiful place. If you get the chance to go I would definitely recommend it, just don’t underestimate the challenge, it’s a tough course so choose your distance wisely! I was really excited when Bournemouth announced they were launching a ‘Marathon Festival’. Since I moved to London, I haven’t been short of local races to participate in, of any distance, but there’s always something special about doing your favourite thing in the place you still kinda call home. Especially when it looks like this. Although the first festival was in 2013, marathon clashes left me cheering on the sidelines so this was the first year I had the opportunity to take part. There is a Bournemouth Bay half marathon in April, but the timing is no good for people running spring marathons, and it’s been plagued by bad reviews more recently. A Bournemouth Marathon Festival is just what the town needed to compete with the likes of Brighton and Portsmouth for running events. The Festival spans over the weekend with a ‘Supersonic 10k’, ‘Supernova 5k’ and junior races on Saturday afternoon, and the Half and Full Marathons on the Sunday. 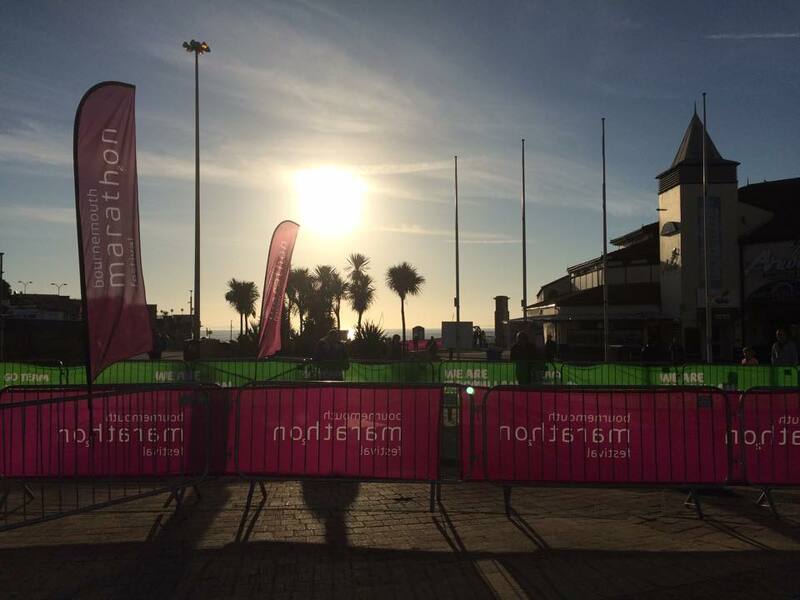 There’s something for the whole family…unless you hate running of course…but we all know the sun always shines in Bournemouth so it’s worth a trip for cheering duties anyway! 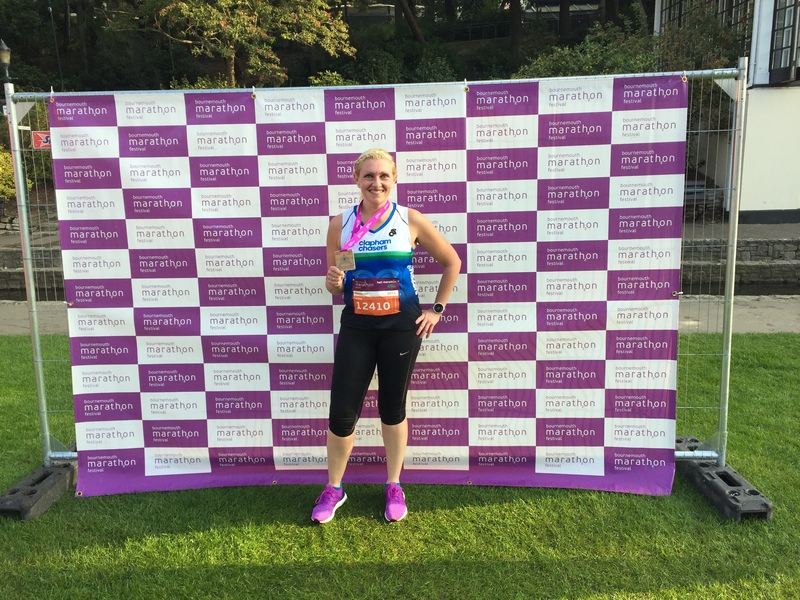 I was in for the Half and the weather was looking mighty fine – sunny, dry, and maybe even a little too warm later in the day but, with a, err, sociable 8am start for my race I didn’t have to worry too much. Mum & Dad dropped me off at Kings Park bright and early and I bumped into Chaser buddy Ed. Ed was in the elite start and, after a quick chat, I was in no doubt he would finish in the top 10. I dropped off my bag, headed to the toilet and started to panic…the queue was reeeaaally long and I only had about half an hour! It was dry and sunny as promised, but it was too early to be very warm. The course headed through a residential street before turning onto Overcliffe Drive towards Bournemouth and switching back towards Southbourne at 3.5 miles. We could see the leaders coming in the other direction and I spotted Ed in 6th place so gave him a cheer. I was feeling surprisingly good, I’d had a cold earlier in the week so thought I might find it tough but my watch said I was running faster than I felt I was so I was obviously in race mode. I knew I would slow at some point but I didn’t feel like I was pushing too hard so found it difficult to slow down deliberately. 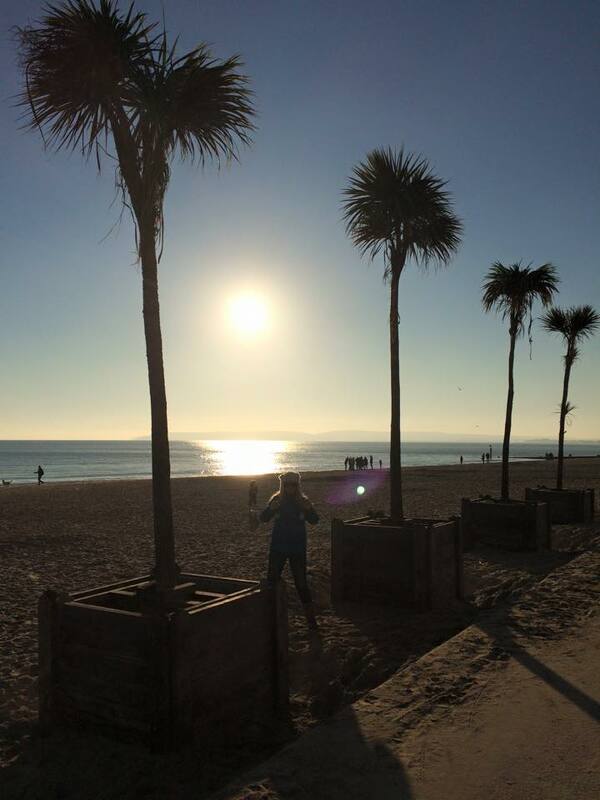 At 6 miles we ran down onto the beach front and switched back towards Bournemouth again along the promenade. It was getting warmer but it was nice to be beside the sea again, even if there wasn’t a welcome wind. At about 8.5 miles we came off the promenade and back up to Overcliffe Drive, this involved a fairly short but pretty sharp hill, I plodded on up but something made me give up half way and I walked (ohhh the shame!). I totally lost momentum at this point, but a mile later we headed back down to the promenade near the finish line and the crowds thickened. I spotted Rick’s girlfriend, who gave me a cheer, and I rounded the corner to see Mum, Dad and my brother. I smiled and sped off (well, sort of). The next section was tough, the course took us away from the crowds and the finish area and back along the front towards Boscombe again, the route is basically a giant zig zag. My pace had slowed and I felt a bit rubbish. I needed sugar, why didn’t I stick a gel in my pocket? Always stick a gel in your pocket! They were actually handing gels out at some point, stupidly I didn’t take one. I was stupid and gel-less and struggling. We ran to Boscombe Pier, along the Pier, turned around and started to head back. I still felt rubbish with only a mile to go and I had a minute walking break which seemed a little ridiculous so close to the finish. Of course, at this point I saw Rick coming towards me, whilst walking…busted! As we got closer to the crowds I tried to go a little faster, I saw my family again, headed up Bournemouth Pier, turned around and ran straight over the finish line. It was a 1:50:41 finish. It was OK but it could have, and probably should have, been a little better… As for Ed, he smashed it and finished in 7th place! All in all though, I loved racing back home by the beach and the best bit was I got to have post run cuddles with my little niece and a homemade dinner from Mum! A speed-zapping stupid hill will, erm, zap your speed, so be prepared! The baggage truck isn’t in an ideal location at the finish, I don’t want to fight through spectators to get my stuff! 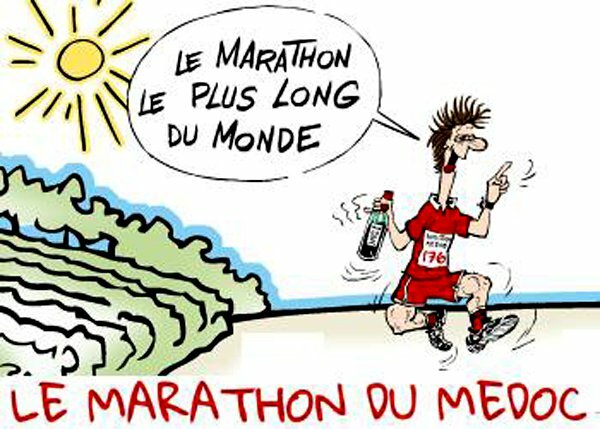 Medoc is one of those races on every marathoners’ bucket list, quite simply, it’s the craziest marathon on earth. 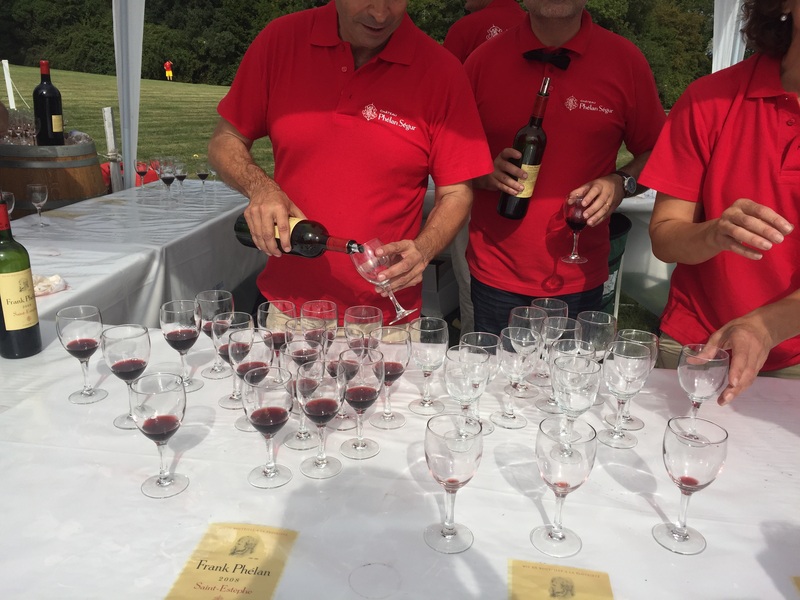 Rather than the usual water and electrolyte stops, there are around 20 wine stations hosted by different châteaus around the beautiful Medoc region in France, proudly waiting to let you sample their finest red whilst you have a dance to a live band before you run along to the next one! Gourmet food stops including oysters, steak, cheese and croissants line the route, as well as the usual banquet of fruit, crisps, crackers and fig rolls you seem to get at every European marathon, and everyone is in fancy dress. 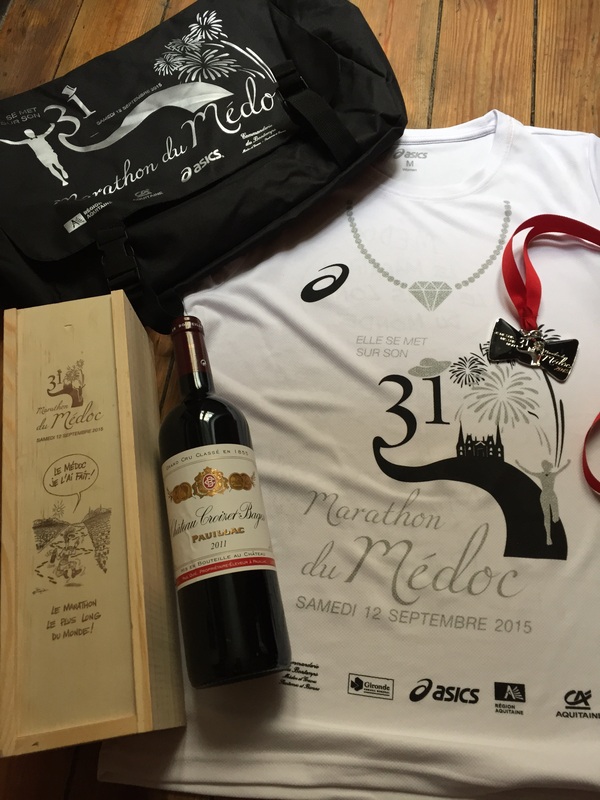 Fancy dress is the Marathon du Medoc law. Whilst it’s certainly a race with a difference, it’s now so successful, this year was the 31st event and it sold out within 24 hours! In all credit to the organisers, despite its huge popularity they still limit entries to 8,500 to avoid compromising the race experience. 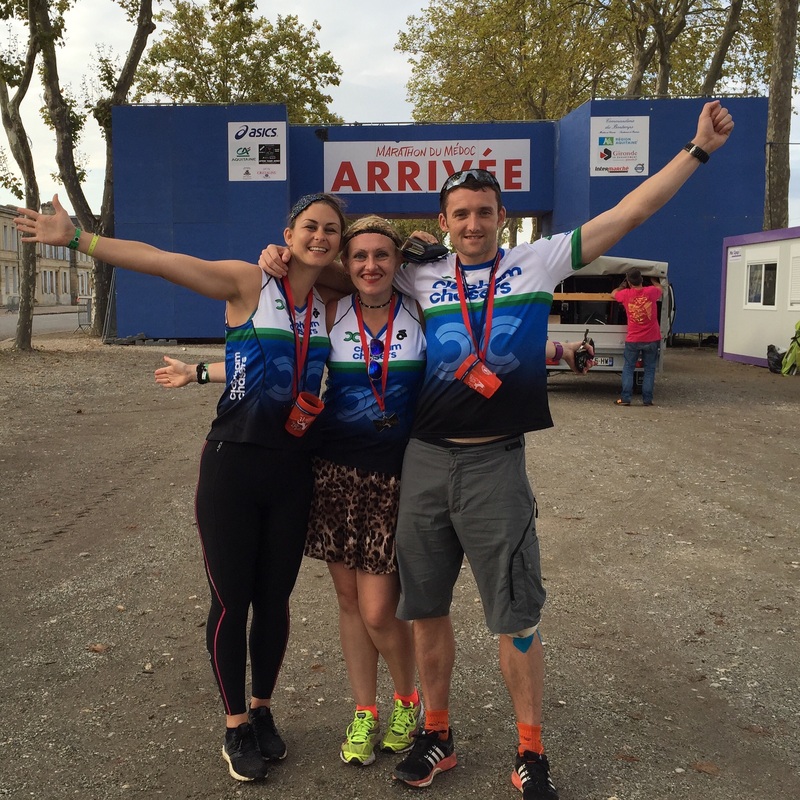 Gemma, Martin and I had been excited for months, we flew to Bordeaux (the nearest main City where we were staying) on the Wednesday, which would give our bodies a chance to get used to the toxic levels of wine that would be necessary for success (sensible training approach). 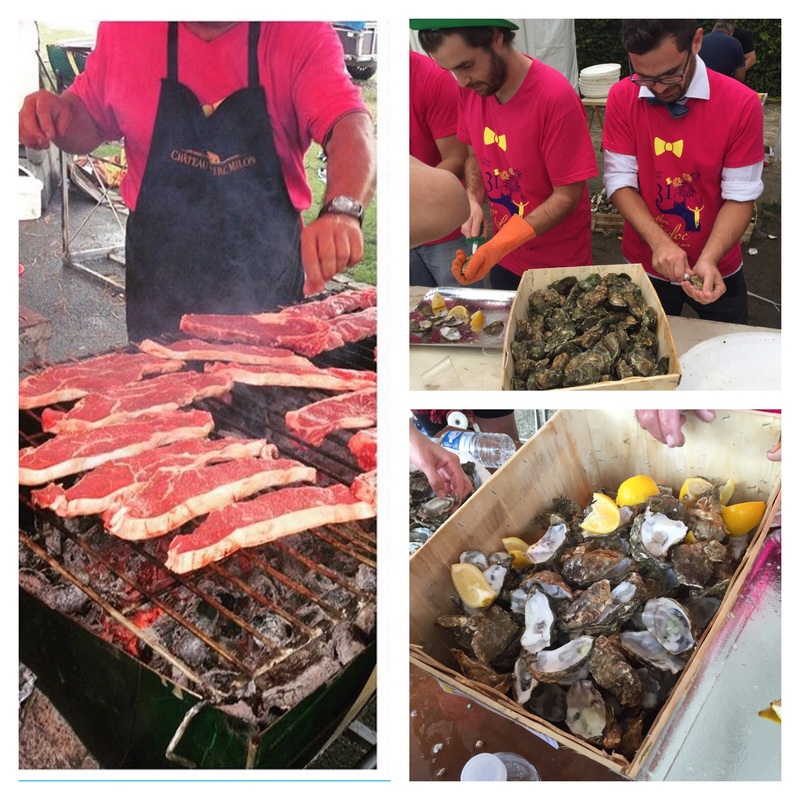 Friday was registration day, so we headed to race HQ in Pauillac where they had set up a little race village with a few stalls and a bar (obvs). Registration was a little chaotic but the queue was short so could have been worse! We had a few beers (and maybe a champagne…hey, we were on holiday!) and walked along the river where there was some wine tasting and various food on offer (the snails did not look happy). Martin and Gemma had a plate of oysters (my previous history with oysters is that they always make me throw up, today was no different but I tried) and we enjoyed the sunshine. 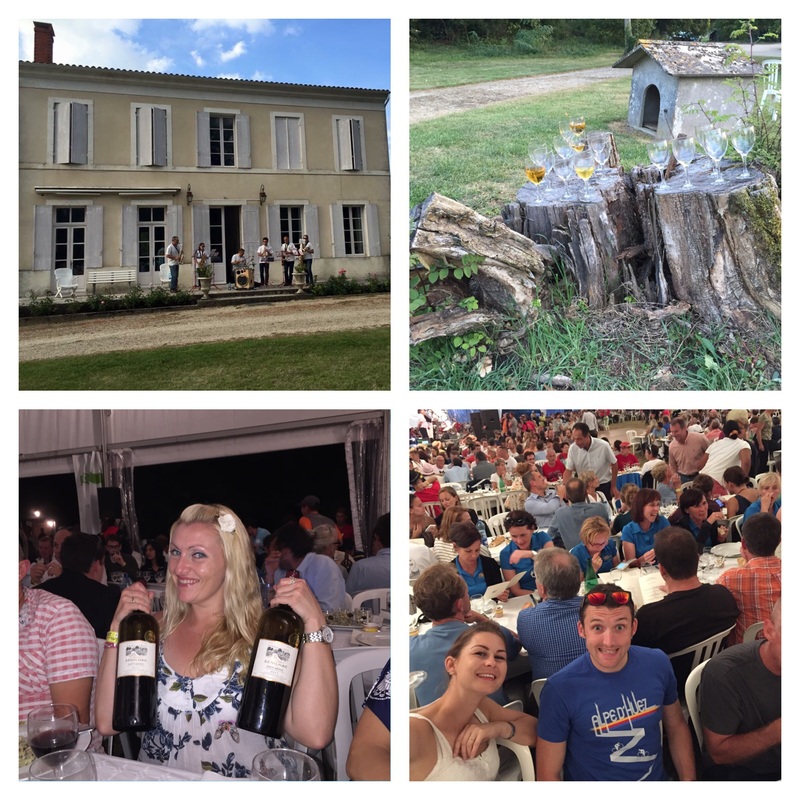 Part of our race package included a pasta dinner party and, this year, it was hosted at Château Senilhac. On arrival we were greeted with a live band and several tables of wine and crisps before being invited into the marquee for dinner. The best way to describe the whole look and feel of it is exactly like a wedding! Dinner was chorizo pasta to start and duck and pasta for main (not ideal if you don’t eat chorizo or duck but I worked around it! ), and some kind of foamy meringue thing for dessert. By this point, we’d made some new friends and all had way too much red wine (to add to the white wine, beer and champagne…) so Martin decided it would be an awesome idea to have a few games of ‘who can inhale their dessert the fastest?’. 5 desserts each, another magnum of wine, and a fireworks display later, it was definitely time to go home. It was a pretty long drive back to Bordeaux which meant we didn’t stumble into bed, a little worse for wear, until 1.30am. With a 5.30 alarm it wasn’t ideal. The next morning was a bit hazy and a bit rushed but we headed out in the dark and rain to get the coach back to Pauillac for the start. The coach was 40 minutes late. The driver was lost. It was raining. We were not impressed, especially as we’d rushed out without taking breakfast (5 deserts might not have been a bad idea after all). Finally, the rain had stopped and we managed to arrive hour before the 9.30 start. 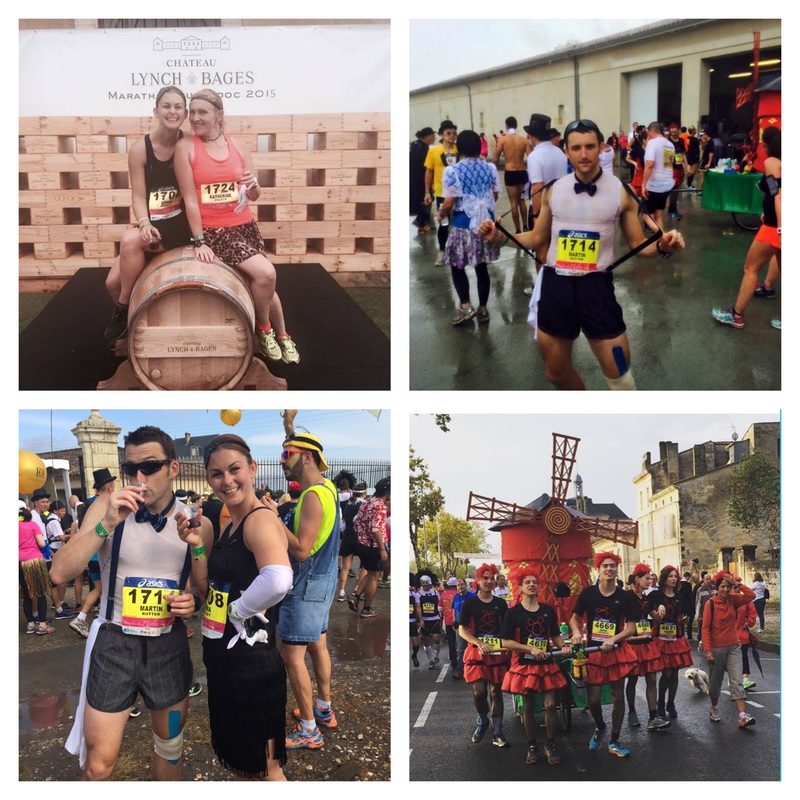 We quickly realised our hangovers weren’t alone, but the atmosphere was thick with excitement as people buzzed around all smiley and wide eyed in their fancy dress outfits, it was a far cry from the solemn seriousness that usually graces marathon day morning. 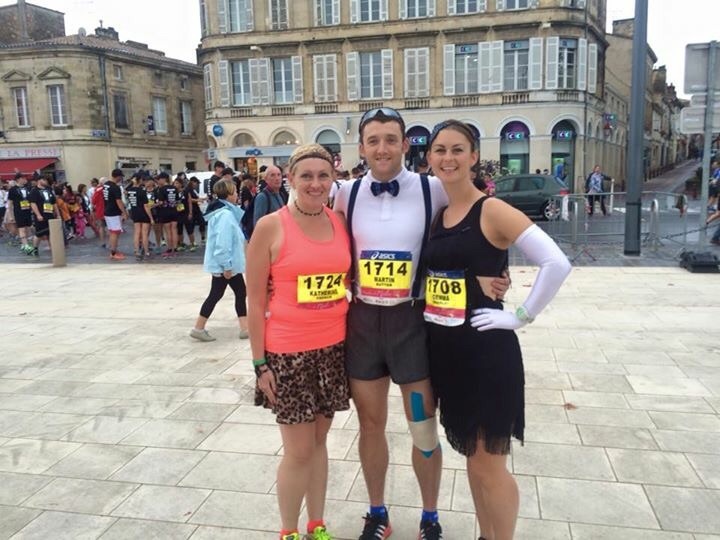 This year the theme was ‘dressed to the nines’ but there were a real mix of outfits from dresses, shirts and bow ties to a full on Moulin Rouge cart, if you were in regular running clothes, you really hadn’t understood the spirit of the event! 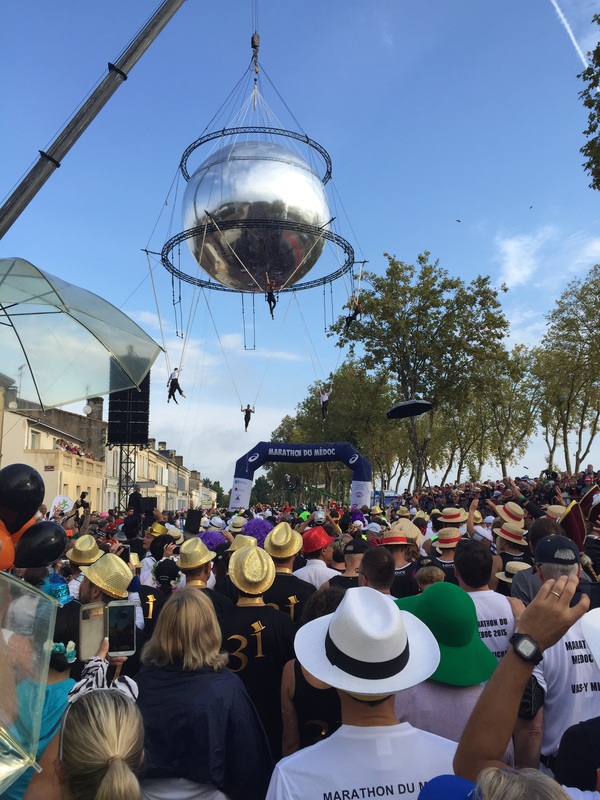 The entertainment started early – a giant silver ball suspended over the start line dangled acrobats on aerial silks as they twirled above the crowd and, before we knew it, we were off! The start was slow going but we weren’t in any rush. The official cut off time is 6 hours 30 so, for those who are serious about it, the ideal finish time is 6:29:59! It wasn’t long before we reached the breakfast stop at 2k, tables of mini croissants and pastries, I was starving! Buttery pastries aren’t my usual choice of marathon day brekkie so I conservatively picked up 2 mini croissants and we ran on, I didn’t want to be sick in the first 30 minutes! Wine was served from the 5k marker, it may have only been 10am but it was delicious! We knocked it back and jogged on. 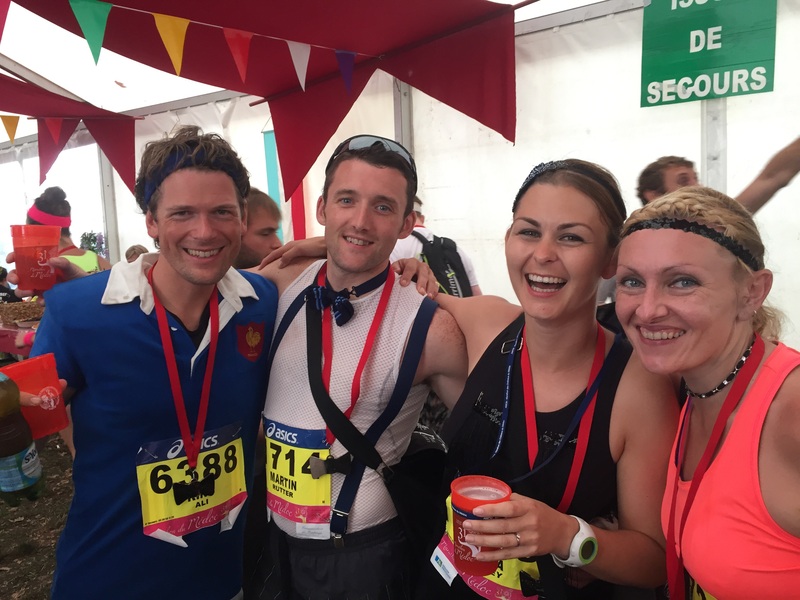 The wine stations came thick and fast for the first 9 miles and we revelled in the novelty of legitimately boozing whilst running, what was technically, a race. Each station came with well dressed waiters in the château grounds, some with live bands, but all with plenty wine and snacks as we guzzled back glass after glass. There was a section in the middle with fewer wine stops and this is when the rain hit us, there was a LOT of rain! It was around this time we realised that a marathon is still, errr, a marathon and it’s still a bloody long way! Around the half way mark I started to feel quite sick, probably not surprising, but I was seriously weighing up the risk of splattering the vineyards with the very grapes that had once grown there. Luckily, the feeling passed! The second half saw more fabulous châteaus, amazing red wine, entertainment and beautiful vineyards, but the rain wasn’t going anywhere. Our paced slowed as we spent more and more time at each wine station, we started having 2 or 3 glasses each time and, at 20 miles, we were even given a healthy shot of whiskey…when in France right?! The gourmet food came in the last 4 miles, I guess they didn’t want too many people feeling sick when there was still a fair way to go. We dined on oysters (kept this one down), cheese, steak (not me), more crisps, and (if they hadn’t run out by the time we got there), ice cream! I’m not sure whether it was the wine, lack of sleep or my post ultra legs (can I still use that excuse?!) but, by this point, my legs were feeling pretty stiff and all I wanted to do was walk. Martin insisted we run so, giving it my best shot, I broke into a jog, but all I heard were fits of giggles behind me…apparently what I thought was an elegant jog was actually a very stiff shuffle. Drunk, soaking wet, and slightly broken, it looked like the Marathon du Medoc had got me exactly where it wanted me, a bit of a mess. We managed to jog the last mile or so and crossed the finish line together in 6:28:59, couldn’t have timed it better! Tired and happy we headed to the finishers tent, obviously it was time for our free beer! The beer tent brought more carnage as we bumped into a fellow Chaser, and we inadvertently got ourselves involved in one too many rounds of drink downing with a big group of rugby lads. 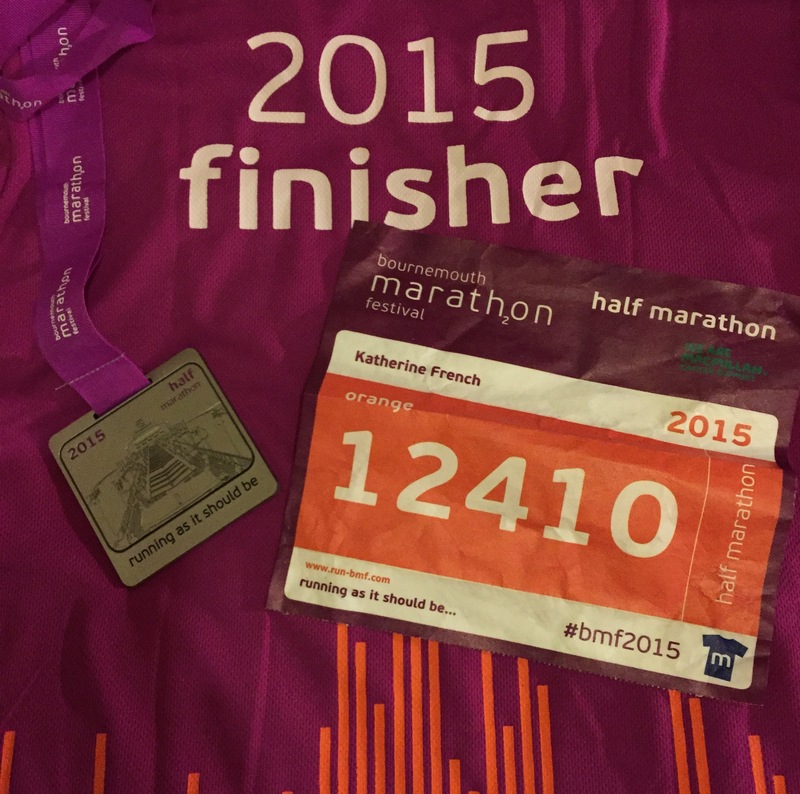 Well, what else would you do right after you finished a marathon?! The evening brought more wine, more champagne, more live music and a pretty spectacular fireworks display. Another very late and drunken night, but an exhilarating experience with 2 of my favourite people! Despite the nature of the event, we only actually saw one person in need of medical attention which is far fewer than any other marathon I’ve run. There’s plenty of water when you want it and, as long as you’re marathon fit and in good health, there’s no reason why you shouldn’t have a really enjoyable run and take advantage of everything on offer. Do it with friends, do it in fancy dress, do it with a smile on your face and do it with a glass of wine in your hand, but make sure you do it. 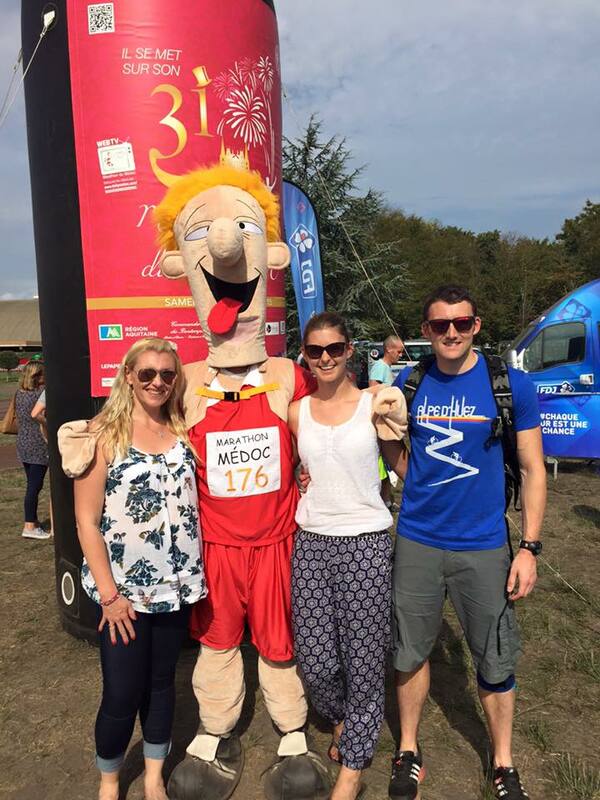 It’s clear Medoc are very proud of their marathon and they certainly should be, it’s a beautifully extraordinary and unique event and they’ve found the winning formula. We absolutely loved every minute of it (well, almost, Martin got stroppy in the rain at 15 miles) and I’ve already decided it won’t be my last time. 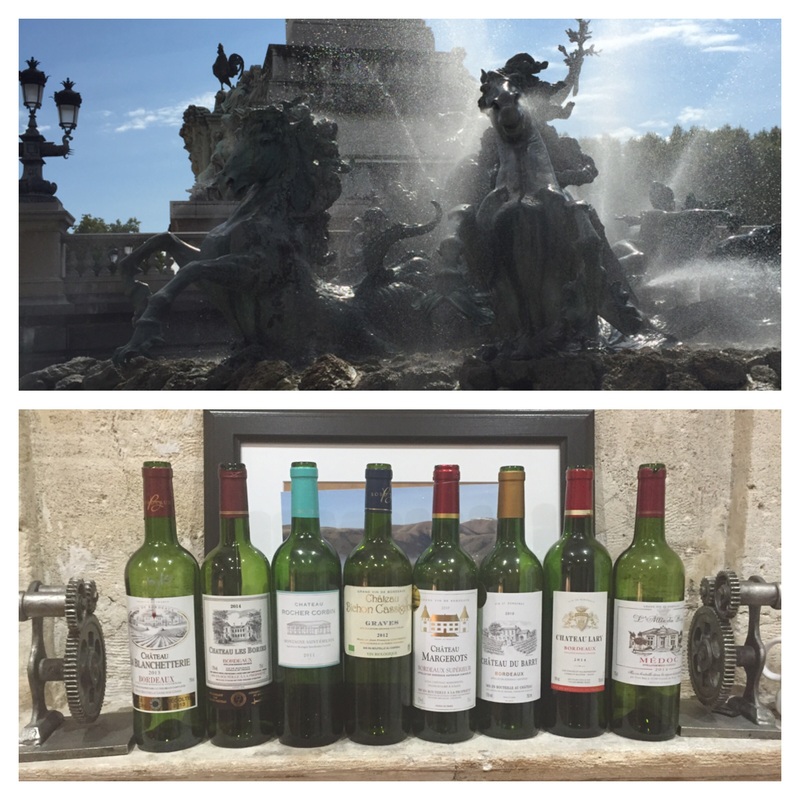 Medoc, you were glorious, until next time, merci et bonne nuit.